Brace yourself: The story of Tommy is equal parts gruesome and heartbreaking. (In fact, some of the photos below you might find jarring.) 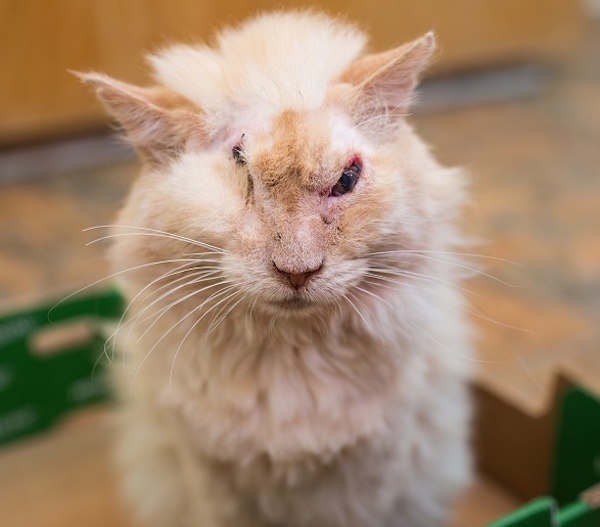 It’s a tale of this stray cat with the lion-esque face, found after some evil human had poured a caustic substance over his head — an attack that burned away about half his face. But Tommy has come through his ordeal, and he is on track to become an animal rights advocate. He’s scheduled to make an appearance at the Walk A Mile In Our Paws special needs cat show on Oct. 22 organized by Milo’s Sanctuary. Tommy’s plight begins in the summer. He appeared in the back yard of a Los Angeles County woman know for feeding stray cats. She noticed something amiss with Tommy. It appeared as if he’d been doused in battery acid. The woman’s daughter is involved in dog rescue, so the two teamed up and took Tommy to a vet. 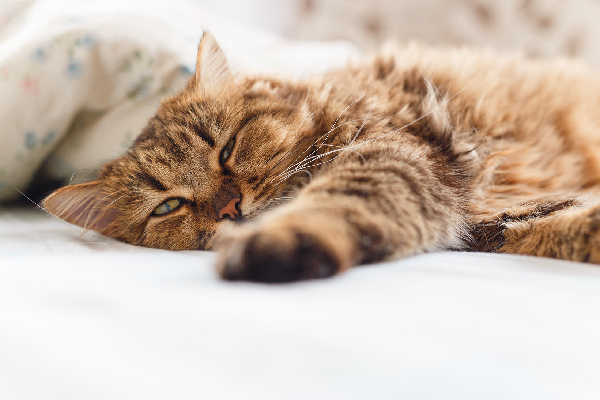 Once there, an exam revealed Tommy is FIV-positive. There was talk of euthanasia. 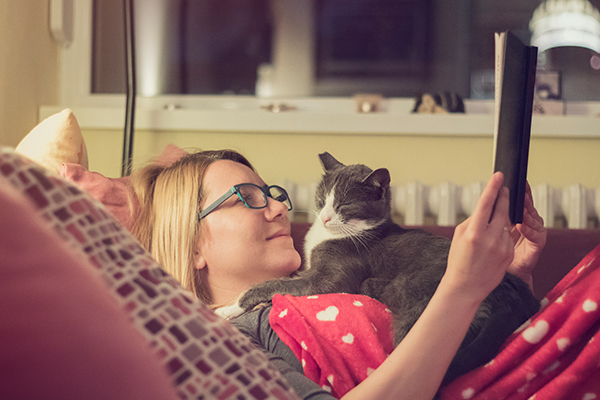 Shocked at this suggestion, the woman and her daughter circulated Tommy’s story on social media — a move that got the attention of the people at Milo’s Sanctuary and Special Needs Cat Rescue. 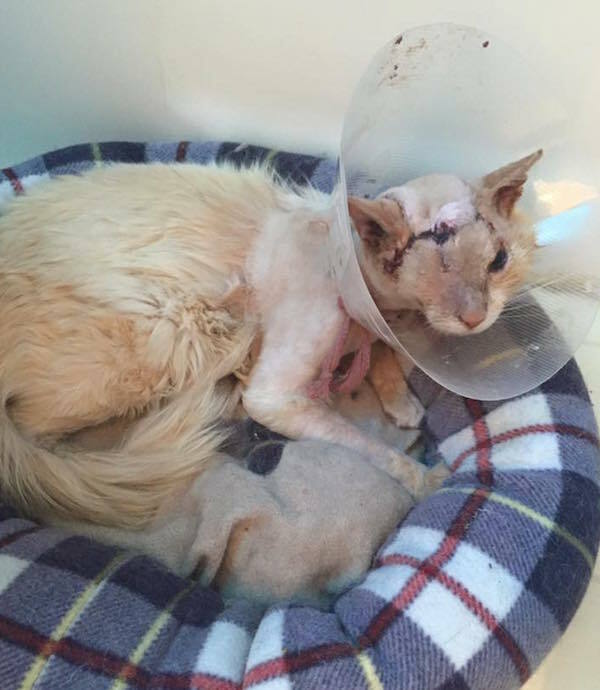 “Tommy was in absolutely terrible shape when we got him to our own vets, the Beverly Oaks Animal Hospital,” says Katherine Agard, the PR director at Milo’s Sanctuary. Dogs had been attacked by acid in the area — many of them marked with similar burn patterns — so people involved in Tommy’s rehab called police. 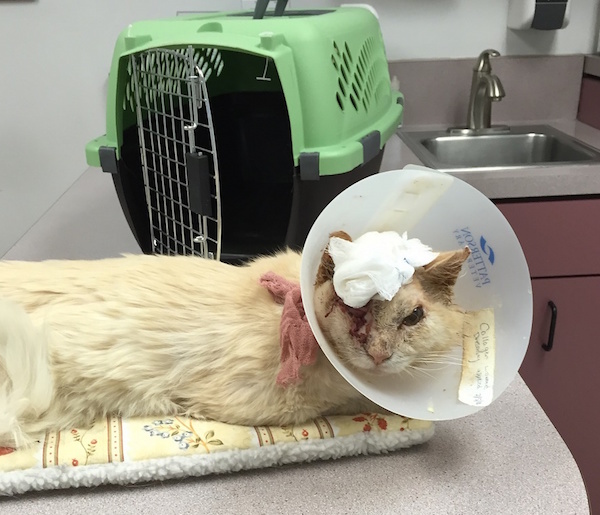 There’s currently a reward out for any information about the animal abuser. The next step in helping Tommy was an intensive period of around-the-clock repair and recuperation at the Beverly Oaks facility. 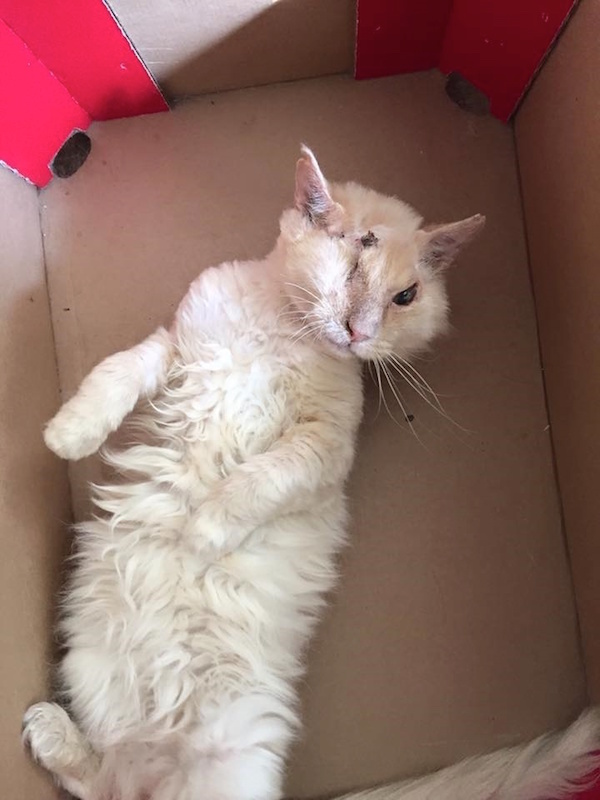 Unfortunately, this plucky cat lost an eye — “it was just too far gone to be repaired,” says Agard — but over the course of a month, the vets tackled Tommy’s upper respiratory infection as well as another infection in his remaining good eye and dermatitis. 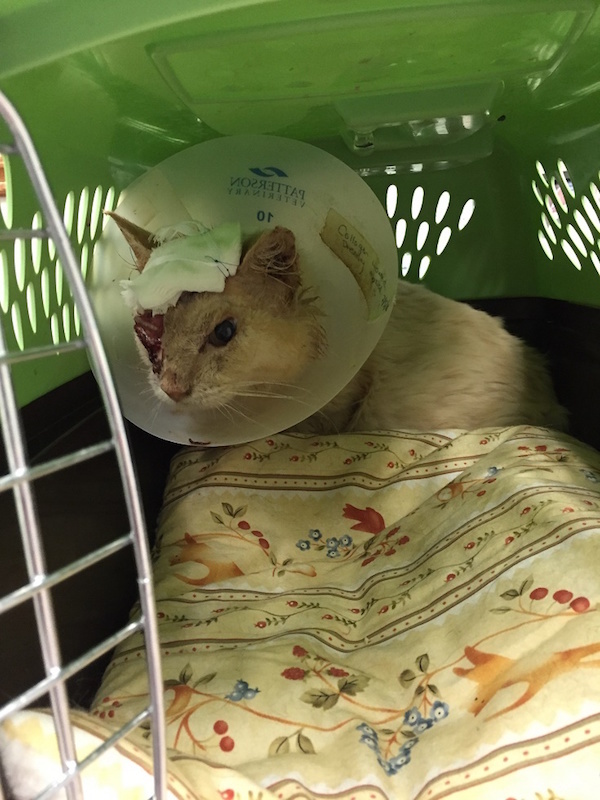 Then came the biggest step: “Once he was strong enough, he underwent three hours of reconstructive surgery on his face and head,” says Agard. Tommy’s recovery has been a long and slow process, but throughout the journey he has amassed an army of fans on Facebook. 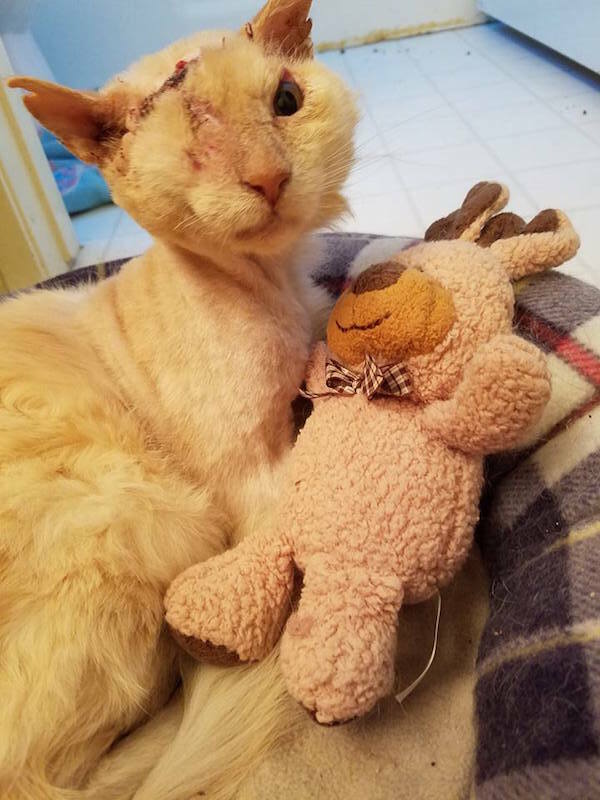 Agard says Milo’s Sanctuary receives daily messages asking for updates on his status; a picture of Tommy cuddling his stuffed bear is said to be the most liked picture the organization has ever posted. Vets cleared Tommy to make his public appearance at the Walk A Mile In Our Paws event. 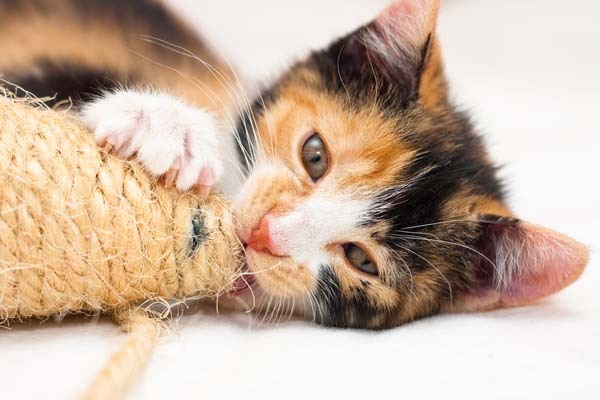 Lil BUB and Oskar the Blind Cat will also be there, so Tommy will make his first steps toward becoming a champion for specials needs kitties. Follow Tommy’s progress at the Milo’s Sanctuary Facebook page. 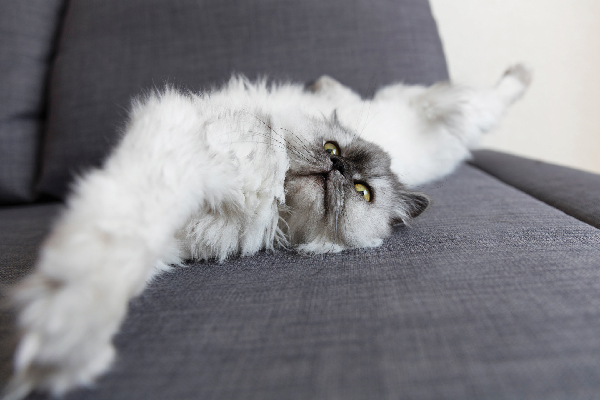 The Walk A Mile In Our Paws special needs cat show and convention takes place Oct. 22 in Arcadia, California. More information is listed on the event website.